Who says chai is just for the cooler months? Blend iced Masala Chai with whole milk and a dash of maple syrup and freeze in popsicle molds for a sweet, spicy treat that’s sure to hit the spot on a hot summer’s afternoon! Start with iced Blueberry Pomegranate herbal tea. Place a few fresh blueberries in each popsicle mold, then slowly add the iced tea. You can add a scoop of vanilla ice cream if desired. Freeze and enjoy! Start with iced Apples to Oranges organic herbal tea. Cut a fresh apple into very thin wedges. Cut a fresh orange into very thin slices. Add one of each fruit slice to the popsicle molds, then slowly add the iced tea. You can add a scoop of vanilla icecream to these as well to make a creamsicle! Fresh raspberries and raspberry and orange flavored green tea make this a perfect way to enjoy a sweet treat! Blend together 3 cups fresh raspberries, 3 cups iced Raspberry Orange Rhapsody green tea, and 1 cup honey. Pour the mixture into popsicle molds, freeze, and enjoy! This one has a few more steps and ingredients, so we've made a recipe card for you below. We used our Culinary Grade Organic Matcha for these. 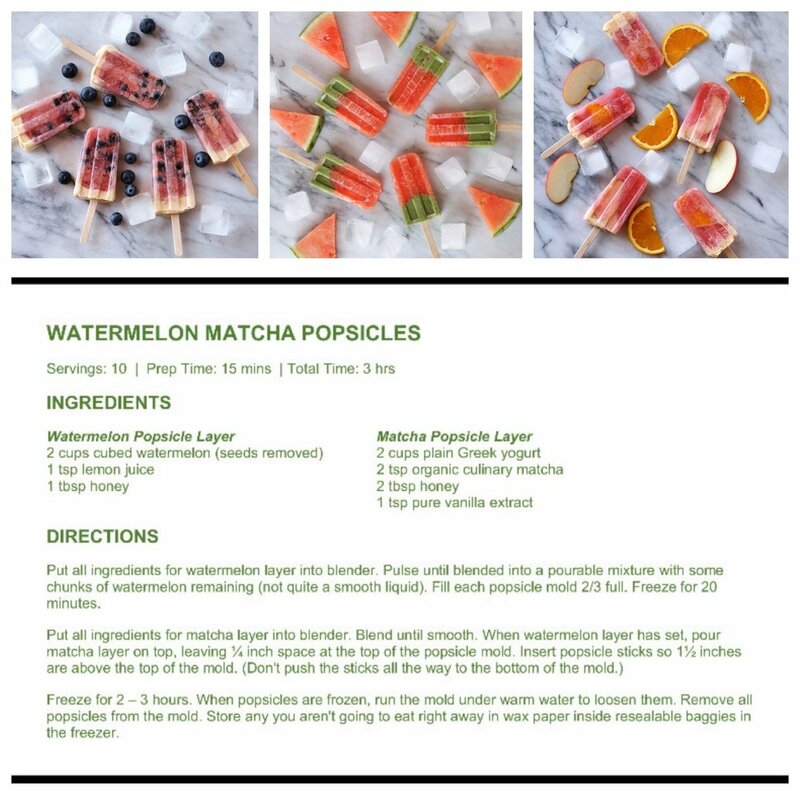 Whichever tea you choose to use, iced tea popsicles are a delicious, fun and healthy way to celebrate summer. Enjoy! It’s warming up here in Santa Fe, and we’re ready to celebrate all things Spring! Whether you’re looking for a warm cup on a cool evening, or an iced tea to cool off with on a sunny afternoon, we’re sure to have a tea that will hit the spot. In need of a light, refreshing palate cleanser? This Lemon Mint tea is a smooth organic black tea blend with bright minty notes and the refreshing taste of lemongrass. Nicely balanced flavor is both uplifting and soothing. Excellent hot or iced. Celebrate all things floral with this lovely, balanced black tea! Midnight Rose is a smooth organic black tea blended with just the right amount of red rose petals - creating an aromatic, flavorful cup with a sweet, floral character. Spring Fancy is one of our most popular (and most fragrant!) teas. This amazing green and white tea blend has passion fruit notes combined with tropical pineapple, papaya and strawberry. Light, fruity, and fun, it’s the perfect tea to ring in Spring with. A superb blend of exceptional quality oolong with natural citrus essential oils. This beautiful tea will carry you away with its uplifting flavor and fragrance! Grown at high elevation in the Fujian Province of China, this is a crisp green oolong enhanced by a subtle grapefruit flavor. This beautiful blend of 100% organic ingredients is a soft embrace! Delicate white tea from the Fujian province of China mingles with aromatic rose petals and chrysanthemum blossoms, creating a delicious, healthy brew. Our lemon cream rooibos is an uplifting herbal delight, the perfect tea for a Spring afternoon. This organic rooibos has the enticing aroma of lemon chiffon cake, and the smooth satisfying taste of a lemon cream. Excellent hot or iced! With everything springing into bloom, this tea is the perfect thing to celebrate with. Green rooibos is unoxidized, and has all the benefits of regular rooibos with a somewhat lighter taste. This flavorful fruit and flower blend is fragrant and fresh tasting! We've combined two aromatic and soothing herbs for a refreshing blend that's quickly becoming one of our most popular herbals. Calming lavender blossoms complement organic peppermint, which is known for its digestive benefits and cooling properties. A fresh, lightly floral cup that tastes great hot and makes a superb iced tea! While fresh summer fruit may be a few months off, this delicious blend of rose petals, hibiscus, and raspberry is sure to tide you over. Tart, sweet, and floral, this tea can be enjoyed hot or cold, and with no added caffeine, it’s the perfect little pick-me-up at any time of day. Rich in antioxidants, mint is a flavorful and aromatic herb that has been used for centuries. While peppermint and spearmint are the most well known varieties, other types include apple mint, lemon mint, chocolate mint and even licorice mint. In the world of tea, mint can be brewed on its own, blended with tea leaves, or combined with flowers, fruit or other herbs. Mint is a tisane rather than a tea, meaning that it is not derived from the camellia sinensis plant, but comes instead from a different family of herbs. At ArtfulTea, we carry many blends containing mint, from herbal infusions to black and green flavored teas. Whether you’re looking for a soothing after dinner drink or an invigorating morning brew, we’re sure to have a tea that will strike your fancy! In Morocco, mint flavored green tea isn't just a tradition, it's a sign of hospitality and friendship. Our blend is the finest Chinese gunpowder tea combined with exceptional quality spearmint. A lively and refreshing tea! This Lemon Mint tea is a smooth organic black tea blend with bright minty notes and the refreshing taste of lemongrass. Nicely balanced flavor is both uplifting and soothing. Excellent hot or iced. We've combined two aromatic and soothing herbs for a refreshing blend that's quickly becoming one of our most popular herbals. Calming lavender blossoms complement organic peppermint, which is known for its digestive benefits and cooling properties. A fresh, lightly floral cup! This handcrafted herbal infusion helps soothe the throat, clear congestion and promote wellness. Best of all, it tastes delicious! One of Santa Fe's local opera singers began drinking this tea to help keep her voice in perfect condition, so we've named the blend "Sing Your Song" in her honor. This top quality organic peppermint leaf is aromatic and exceptionally minty, producing a refreshing infusion that is satisfying both hot and cold. In honor of Alice at the Mad Hatter's tea party, this herbal blend tastes like a party of many bold flavors. Peppermint and ginger take the lead roles and are beautifully supported by the taste of apples, almonds, hibiscus and rose. Here at ArtfulTea, we carry a wide range of teas, from affordable everyday blends to teas that are rare, unique, or otherwise noteworthy. While all of our loose leaf teas are made from the highest quality ingredients available, our premium teas stand out for their exceptional quality, and are perfect for tea connoisseurs, gifts, and special occasions. Grown in the Himalayan Mountains of Nepal, this award-winning black tea is rich and mellow, with notes of honey and stone fruit. It brews into a reddish-golden color that provides a flavorful and well balanced cup. From Shizuoka on the Fujiyama mountain slopes, this organic Japanese sencha is carefully processed and slightly steamed before rolling and drying. A distinct, strong green tea with a rich, grassy aroma, these leaves brew into a bright greenish-yellow liquor with a taste reminiscent of the sea. From the Chongqing Province of China, this very rare tea is the top grade of white tea available. It has a delicate, clean taste faintly reminiscent of fresh apples, with a refreshing lingering flavor. Organic Bai Hao Silver Needle tea leaves are scented with fresh jasmine blossoms to create a well-balanced tea with the tantalizing floral taste of jasmine. This superb quality tea offers one of the most sublime tea drinking experiences available. An “Autumn Flush” tea from Nepal, this double roasted oolong is full-bodied, with subtle notes of apricot, malt and caramel in a deep amber-red brew. Many infusions are possible with these leaves. Purple tea is an entirely new category of tea! A purple leaved varietal of the camellia sinensis plant, it was first discovered growing wild in the Assam region of India, and is now grown commercially in Kenya, Africa. Ours is from the Tumoi Tea Garden in the Nandi Hills of Kenya. This purple leaf tea has a similar flavor profile to oolong, and is also very high in anthocyanins and antioxidents. At ArtfulTea we’re very proud of our premium tea selection, and are always excited to introduce our customers to these unique and wonderful teas. Whether you’re looking for the perfect gift for the tea lover in your life, or are just looking to indulge in something a little extra special, our premium teas have something to offer everyone! Whether you’re dreaming of the fresh fruit of summer or are simply interested in a sweet, fruit-forward cup, here at ArtfulTea we carry an expansive selection of flavored teas with fruity notes. From Orange Peel to Lychee Purple and everything in between, we’re sure to have a tea that will satisfy your sweet tooth and remind you of the bounty of summer. And if you’re luxuriating in the long days of the warmer months, these teas are also lovely served iced! Organic apricot pieces and natural brandy flavor give this black tea blend a delicious full flavor and luscious sweetness. An aromatic and visually appealing blend, it’s also our best selling flavored tea. Delicious hot and excellent iced! Tangy and sweet with a little bite, Orange Peel blends organic black tea with organic orange peels for a delicious drink that's loaded with citrusy flavor. Aromatic and naturally sweet, this tea is sure to be a crowd-pleaser. This enlivening blend of pomegranate and lemon is equal parts sweet and tart, and it's naturally loaded with antioxidants and vitamin C. A crisp, tasty black tea with tons of flavor! Sweet papaya and strawberries blend with black and green teas for an intoxicating, exotic flavor reminiscent of fresh fruit and long summer afternoons. Sit back and enjoy over ice in the warmer months! White peony tea is blended with organic mango cubes, apple, and pear to create a beautifully delicate, fruity, floral tea with a light body and sweet, uplifting flavor. Low in caffeine, this tea will give you a modest boost and is perfect for a relaxing, rejuvenating afternoon cup. This organic blend of sencha green tea with dried goji berries, sweet strawberry pieces and acai berry powder is not only packed with antioxidants, but also tastes delicious! The sweet and vegetal flavors mingle to create a lovely cup of berry green tea with numerous health benefits. This purple leaf tea is blended with lychee, apple, and pineapple for a rich, fruit-forward tropical taste. With a medium body similar to that of an oolong, Lychee Purple is also very high in anthocyanins, the beneficial compounds found in blueberries, eggplant, purple grapes and other blue, purple or dark red foods. South African rooibos that's oh-so-fruit-forward! Juicy organic mango combines with sweet organic strawberry to create a delicious, refreshing and flavor-filled tea with no calories and no caffeine. Our Peach Rooibos blends green and red rooibos with peach bits, blackberry leaves, and calendula petals for a sweet, fruity cup. Like biting into a ripe peach on a warm summer’s day! Remember the 1940’s Brazilian singer whose signature headdresses were made of tropical fruit? The amazing Carmen Miranda is the inspiration for our tasty rooibos blend of pineapple, coconut, banana and apple. This combination of Caribbean fruit makes a delicious hot tea, but truly shines when served iced. Apples to Oranges is a sweet, tart blend of apple, orange, rose hips and hibiscus. All organic ingredients, lots of vitamin C, and no caffeine make this tasty treat hard to beat! Blueberry Pomegranate is delicious fruit tea packed with flavor and beneficial properties. Pomegranate and blueberries add sweetness to tart, healthful hibiscus in this lovely, fruit-forward blend. One of our most popular herbal teas, Blueberry Pomegranate is delicious both hot and iced, perfect to sate a sweet tooth. Citrusy and with a hint of sweetness and spice, Earl Grey is a tea flavored with bergamot essential oil. While the history of Earl Grey tea is unclear, it most likely acquired its name from Earl Charles Grey, a 19th-century British Prime Minister who helped to popularize the tea. Today, Earl Grey is a well-loved classic. Bergamot is a small, pear-shaped citrus fruit cultivated primarily in the Mediterranean. The aromatic essential oil pressed from the rind of bergamot has a slightly spicy, citrusy taste that, when added to tea, lends Earl Grey its distinctive flavor. While bergamot is typically added to black tea to make a classic Earl Grey, the essential oil can be added to any type of tea to create a similar flavor. Whether enjoyed on its own or with a splash of milk and sugar, Earl Grey makes a lovely cup of tea no matter the variety. At ArtfulTea, we offer five versions of Earl Grey: three black teas, one green tea, and even an herbal infusion made with rooibos! Our Organic Earl Grey is a true classic, blending Yunnan black tea with bergamot essential oil from Italy to create a rich tea with a smooth, citrusy flavor. Earl Grey Français is made with bergamot from France, and is an exceptionally aromatic and flavorful blend with a touch of spice. Earl Grey Lavender blends Earl Grey tea with lavender blossoms from Provence to create a wonderfully relaxing tea with a soothing floral note. Interested in Earl Grey with a twist? Our Green Tea Citrus is a delicious variation on a timeless favorite, blending sencha green tea with bergamot, lemon peel, and orange blossoms. This version is a bit lighter than a traditional Earl Grey, with the vegetal sweetness of sencha acting as a perfect complement to bergamot’s citrusy spice. Earl Grey Rooibos is a wonderful option for those looking to cut down on caffeine or for a soothing bedtime cup. Rooibos, a naturally caffeine-free herbal tea, is blended with bergamot to create a flavorful and aromatic cup that warms and soothes. Whether you’re looking for a classic Earl Grey, or to explore the rich variety of bergamot flavored teas, we’re sure to have something that strikes your fancy! Hibiscus tea is an herbal tea made from the dried petals of the hibiscus plant (hibiscus sabdariffa) and is also sometimes known as roselle. It has a pleasantly tart, sweet flavor reminiscent of cranberry, and brews up a vibrant magenta color. Hibiscus is also used to add color and flavor to many other varieties of herbal tea. This tea is enjoyed worldwide, and is often sweetened and spiced depending on regional culture and cuisine. While hibiscus tea can be served hot, it also makes a delicious iced tea! Hibiscus is extremely high in vitamin C and full of antioxidants. Studies have shown that hibiscus may have a variety of other benefits as well, including lowering blood pressure and helping to maintain a healthy weight. Hibiscus is naturally caffeine-free, making it a great alternative for those trying to steer clear of caffeinated drinks. At Artful Tea, we carry a variety of teas containing hibiscus, from pure hibiscus tea to other flavored herbal infusions. Whether you’re looking to try hibiscus for its medicinal properties or are simply looking for a unique, refreshing drink, we’re sure to have a tea that will strike your fancy! An herbal blend containing rose petals, hibiscus, lemon peel, rose hips, and apple pieces, our Rose Petal Raspberry is sweet, tart, and aromatic! While this herbal infusion is excellent hot, it truly shines when served as an iced tea. Looking for the flavor of a mulled wine, minus the alcohol? Our Mulled Wine Fruit Blend is sure to hit the spot. This tea contains apple pieces, hibiscus, elderberries, rose hip peels, mistletoe, cinnamon rods, celery seed oil, orange slices and cloves, and is spicy, sweet, and tart all at once. Curl up with a hot cup and enjoy. Dreaming of fresh fruit and summer? Pomegranate and blueberries bring out the best of each other in this nutritious, fruit-forward blend, one of our most popular herbals. Striking a perfect balance between sweetness and tartness, this refreshing tea is one of a kind. This tea is a lovely, fruity concoction full of apple, orange, rose hips and hibiscus. With all organic ingredients, lots of vitamin C, and no caffeine, this tea is a true crowd-pleaser. It’s excellent hot or iced, and even makes a great iced tea popsicle! A member of the ginger family, turmeric is becoming popular for its unique taste and many beneficial properties. The root of the turmeric plant is dried and ground to create a vibrant orange spice, which is used for cooking, teas and tisanes, herbal remedies, and more. Used for centuries in traditional Ayurvedic medicine, turmeric is full of health benefits. It is especially known for its anti-inflammatory properties, and can be used to help manage joint pain and arthritic. Turmeric also contains antioxidants, and makes a healthy addition to teas and tisanes. With a base of Gunpowder green tea, this tea adds turmeric, ginger, and tropical fruits like mango, pineapple, yuzu, and lime to create a tangy, naturally sweet cup. With a mild amount of caffeine, Turmeric Mango can be a great way to start the day or to power through the afternoon. And with all the health benefits of both green tea and turmeric, it’s sure to keep you in good spirits! Spicy and sweet, warm and soothing, our Atomic Gold herbal tea is a perennial favorite. This remarkable blend of turmeric, ginger, licorice, lemongrass and orange has a deep and satisfying flavor while also providing outstanding health benefits. It brews up a beautifully bright golden color, and has a lingering sweetness that’s sure to warm you from the inside out. With no caffeine, Atomic Gold can be enjoyed at any time of day, and makes a wonderfully soothing before-bed cup. While tea is delicious no matter the time of year, there’s a special savor to a warm cup of tea enjoyed on a cold winter day. For the winter months, here are a few teas that are sure to keep you cozy no matter the temperature! A spicy blend of black tea with apple, cinnamon, cardamom, cloves, orange slices and pink pepper, Solstice Spice is a wonderful tea with a taste reminiscent of the holidays. It’s a classic spiced tea with a naturally sweet, comforting flavor. A campfire in a cup! With its distinctive smoky characteristics, this organically grown Lapsang Souchong tea is deeply aromatic with a smooth, crisp character. Reminiscent of woodsmoke and even expensive cigars, this classic, rich tea fills the mouth with an unexpectedly sweet pine flavor. Lapsang also pairs well with milk and honey. With their rich, robust flavor and hearty body, pu-erh teas are a natural fit for winter. Our caramel pu-erh combines the sweet decadence of caramel with the earthiness of an aged pu-erh to create something akin to dessert in a teacup. Smooth with a naturally sweet finish, this tea is warming and thick, and is excellent with a splash of milk. Dandelion root, cinnamon, ginger, and lemon peel combine perfectly with pu-erh and oolong teas to create a purifying blend that also warms and restores you. This balanced blend has a delicious, rich flavor, and it offers benefits from ingredients traditionally thought to aid digestion and support health! A perfect pick-me-up if the cold weather has you feeling run-down. We've blended two traditional Japanese green teas together here, with the result being a tasty hybrid cup of tea! Genmaicha is a Japanese tea containing roasted brown rice, while matcha is a powdered green tea traditionally used in Japanese tea ceremonies. These two teas combine together beautifully, creating a rich, toasty, earthy flavor that is creamy and slightly sweet. This green tea is a festive blend of almond and orange with a surprising pine-like flavor. Chinese sencha and Japanese bancha are combined with refreshing orange and nutty almonds for a lovely cup that will keep you warm from the outside in. Atomic Gold is spicy and sweet, warm and soothing, while also incredibly healthful and tasty! This remarkable blend of turmeric, ginger, licorice, lemongrass and orange has a deep and satisfying flavor while also providing outstanding health benefits. It brews up a beautifully bright golden yellow, and is sure to cure your wintertime blues. Dreaming of summer? Our Tuscan Sun is a colorful blend of flowers, fruit and herbs reminiscent of a sunny meadow in Tuscany. The floral aromas of lavender and orange blossoms combine with the sweetness of apple, linden and melissa leaves for a relaxing, smooth herbal blend with soothing therapeutic properties. Superior quality vanilla is the secret to the smooth, rich, creamy taste of this popular flavor of rooibos. Packed with antioxidants and caffeine free, Vanilla Rooibos is satisfyingly sweet with an infectious warmth, perfect as a cup before bed. This tea is calling out for you to curl up by the fire with a good book and enjoy! Indian black teas make a great alternative to coffee, as they brew up dark and strong, have a full body, and are high in caffeine. While Chinese blacks tend to be mellower and more delicate, Indian blacks have a little bite to them, and with about half the caffeine of a cup of coffee, they still pack a punch in terms of morning energy. They are delicious taken black, or with added milk and sugar. Our Irish Breakfast, a blend of Assam and Tanzanian teas, is a robust breakfast tea that’s sure to please those who are looking for the strength and richness of a cup of coffee, with the added benefits of tea. Irish Breakfast tea leaves are especially fine, and they brew up a strong, dark cup. Our Assam, a rich black tea grown in the Assam region of India and traditionally used in many breakfast blends, is another great option. Pu-erh teas, like black teas, have about half the caffeine of a cup of coffee, making them another excellent candidate for a morning cup. Unlike black teas, however, pu-erh is lightly fermented, giving it a deep black color and luxurious, earthy taste and texture that’s sure to appeal to those fond of the depth and richness of good coffee. Pu-erh is sourced from the Yunnan province of China, and has a fascinating history stretching back hundreds of years. At Artful Tea, we carry three different varieties of pu-erh. Our organic Leaf Pu-erh has a rich, mellow, earthy flavor, while our Caramel Pu-erh adds a depth of malty, nutty sweetness to its pu-erh base, and is perfect with a splash of milk. Our Dandy Cinnamon Pu-erh includes dandelion root, cinnamon, ginger, and lemon peel, and has a pleasantly tart, uplifting flavor that warms you from the inside out! Yerba Mate is a type of tea made from the leaves and stems of the holly plant ilex paraguariensis and popular throughout South America, particularly in Brazil and Argentina. Mate is high in caffeine, containing almost as much as coffee per cup. Mate is said to contribute to focus, clarity, and alertness, without the jitters that come from drinking too much coffee, making it a great alternative for those looking for a stimulant without adverse side effects. It is traditionally drunk out of a hollow gourd through a straw known as a bombilla, but can also be prepared in the same way as other teas and tisanes. Our traditional Yerba Mate is a great option for those looking to try mate on its own, with no added ingredients. Our Nutty Mocha Mate is a rich, delicious blend of mate with chocolate and hazelnut, sure to appeal to those with a sweet tooth, while our Lively Lemony Mate is an uplifting, citrus-forward brew that’s sure to start the day off on a great note! With these options and more to choose from, tea can be a wonderful alternative even for committed coffee drinkers, whether they’re looking to decrease their caffeine intake or simply reap the many benefits that tea has to offer!